Hispania Racing ended its first ever season in Formula 1 in a very good way, after achieving its ninth double-finish of the year and its fourth in a row today in Abu Dhabi. Both Hispania Racing drivers, Christian Klien and Bruno Senna, got their race off to a good start and were able to avoid the crash on the first lap. After that, both of them drove at constant pace and were able to keep close to the other new teams, fighting for positions with them for the last time this 2010 season. It was a strong race for Hispania Racing, and Bruno Senna ended up 19th and Christian Klien was finally 20th. Dr. Colin Kolles, Team Principal: "We are happy about our ninth double-finish of our first season in Formula 1. We were on a good strategy when we decided to do our pit-stops during the safety car period and could win some positions then. Unfortunately, we lost too much time due to blue flags during the race but both drivers showed a good performance. At the end of a hard first year in Formula 1, we became more and more reliable and constant in our results. I want to thank the whole team who managed the impossible and made us become part of the highest series in motorsport. We are going the right way and we are fired up for the next season in 2011." Christian Klien: "It was a tough race today and it was very hot inside the car. The car was difficult to handle with a lot of fuel, but the lap times got better with less fuel. It was a positive race weekend for the team, as there were no technical problems. We could see that the gap to the other new teams got smaller and we could go at a constant pace. I want to thank everyone in the team for the extraordinary job they did all over the season and for giving me the opportunity to compete in the Singapore, Brazil and Abu Dhabi races." 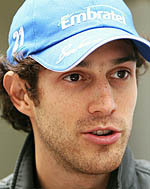 Bruno Senna: "Today was a good but very tough race here in Abu Dhabi. I tried to push and get close to our competitors in front but then I was in traffic, so that didn't help us end further up. I enjoyed my first season in Formula 1 and I want to thank the team for their hard work they did during the year. I really have learnt a lot and it was a good preparation. You learn so much by actually racing that I can't wait to put all this experience into practice next season."